Daring Faith is a spiritual growth and stewardship campaign that we launched in 2016! Over the 6 weeks of the campaign sermons, ministries, and our LIFEgroups are aligned around the Daring Faith material. The most important part of the campaign is prayer! Join us for corporate prayer each Sunday at 9:30 am at the Immanuel Chapel! Attend service each Sunday during the campaign and/or listen to the sermons online! Sign up to attend a LIFEgroup. Sign up sheets and books are being sold each Sunday in January and February for the campaign. Complete the daily Daring Faith devotional in the Daring Faith Study Guide. Pray that God will increase our faith, fellowship, and do the miraculous in the life of the church and our families!! 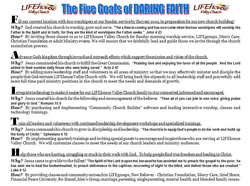 Click on the image to the left to download a copy of The Five Goals of Daring Faith! Join us as we pray for each of these goals together and we step out in Daring Faith in 2016!